For runners who aren’t afraid to hit the road after hours have plenty of options—like reflective clothing and gear—to help them stay visible in the darkness. 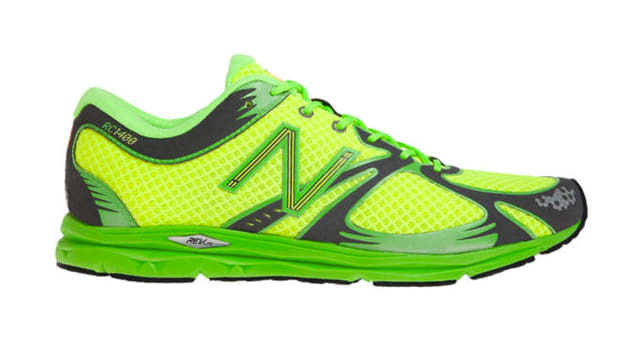 But if you really want to go all out, try on a pair of the New Balance Glow In The Dark 1400. New Balance took one of its most successful racing flats in the 1400 and gave it a glow-in-the-dark finish for runner safety. The shoe offers the same responsive cushioning via a REVlite midsole as the standard 1400, just in a frame that can light up the trail. The 1400 is integrated with glow-in-the-dark features throughout, including the welded seams on the upper, the collar, heel counter, and branding. It’s incredibly lightweight at 7.1 ounces, and features a 10mm drop for a stable ride.